Discussion in 'General Pokémon Discussion' started by shoz999, Oct 23, 2018. 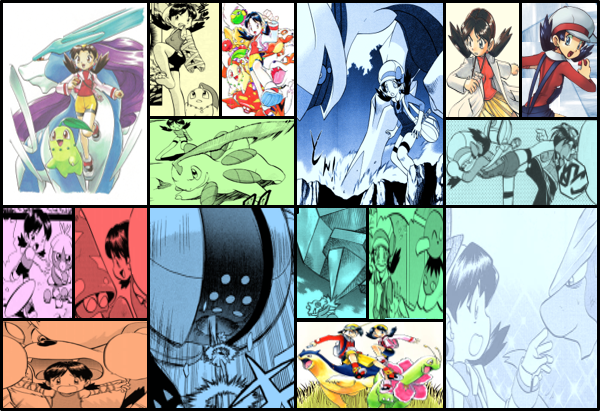 Games, Manga, Anime and perhaps some other form of media out of the usual big three Pokemon story mediums. List your favorite trainers who own legendaries! I'll start with my favorite Trainer-Legendary duo! Diamond (Lucas) and Reg, a Regigigas! Regigigas Slow Start ability deactivates! Reginator - "MY BODY IS READY!" 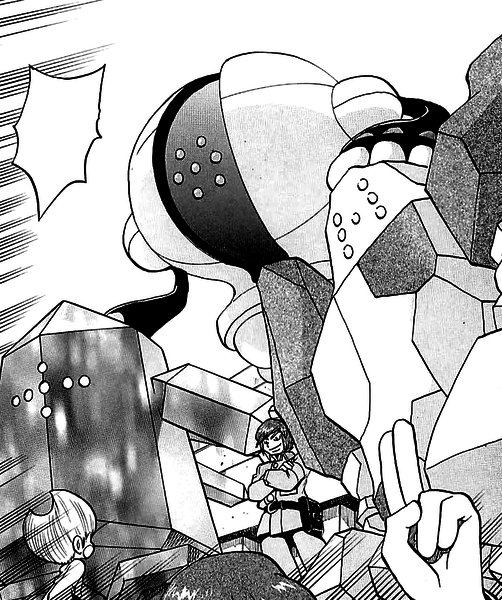 When Diamond seemingly died, Regigigas maintains his loyalty to his trainer to the end, *****-slapping Giratina lol like he was nothing. Yes, Regigigas is that freaking strong that he has the colossal strength to take on a healthy creation Dragon at full strength. Actually to be specific, he literally grips Giratina by the head and throws the massive dragon with great ease, sending Giratina's head crashing into the ground. When I say big three I'm referring to the Games, Anime and Manga in terms of storytelling. Big Four if were including the TCG which is rarely used in cross-media sections. I see my sentence is a little confusing, what do you think of it now? Confusing, less confusing, more clearer? That's actually something they display in the manga. Regigigas is slow at first but when he gets up and running, he's a freaking beast. 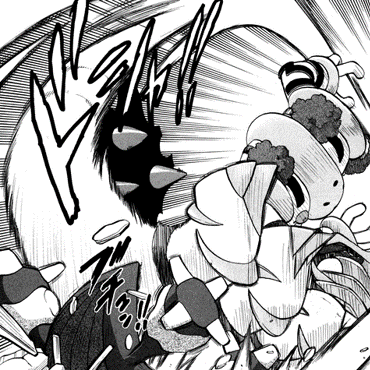 In competitive, Regigigas is actually the only Pokemon who cannot learn the move Protect. The way to bypass his ability is the same way to bypass Slaking's ability. Either go to Double Battles and use moves on your alley, like Gastro Acid or Skill Swap, to remove or switch abilities or in Single Battles, not guaranteed as Doubles, use a Cofagrigus to change the enemy Pokemon's ability with Mummy and then use Regigigas to attack that Pokemon and gain that ability. You know an obvious favorite I'm surprised no one listed yet is Brandon and his Legendary Titans. I normally like the Pokemon Adventures adaptation of VG characters over the anime a lot however I have to admit it's pretty hard to choose between anime Brendan and manga Brendan. Their both really good characters with great battling skills. I'm kind of leaning to anime Brendan because there is more "anime action" strategy in his battles but I'm kind also leaning to manga Brendan because his counterpart focuses slightly more on the Competitive Gen 3 strategy aspect while also the fact that his Legendary Titans ARE ACTUALLY THE SIZE OF GIANTS which I suppose is fitting since they are golems. Since Darkrai is one of my top 10 favorite Pokemon, I'd have to say Tobias. Tobias isn't one of my favorite trainers but I did enjoy seeing Darkrai in battle commanded with strategy. You know what this reminds me of? Mewtwo. What does that have to do with Darkrai? That's for you to find out lol. Another one of my favorite trainers is Blaine who befriends Mewtwo. Actually their relationship doesn't start out friendly. In fact what's interesting is that Blaine thinks Mewtwo is nothing more than a monster full of rage and destruction. Due to this, he wants to destroy Mewtwo for good with Red's help. Red captures Mewtwo but he thinks Mewtwo is really no different from other Pokemon. If a Pokemon is raised by a terrible person, the Pokemon will turn out to be terrible. If the Pokemon is raised by a person of a good heart, the Pokemon will turn out good. Blaine is actually curious and he notices that Mewtwo who has calmed down and is willing to start over again. From this we see Blaine and Mewtwo have a fair amount of epic adventures and fights together. It's also through this that Blaine becomes one of the three humans that Mewtwo trusts. Pyramid King Brandon, I like his personality. McAfee is best and effective antivirus software that offers excellent features of protecting and removing virus and threads of your PC and laptops. For the support and further information contact McAfee Activation. You know what I just realized. SPOILERS! How Kusaka the Pokemon Adventures writer, gave Colress, Kyurem. I don't think he just gave Colress Kyurem to just make him dangerous, I just realized Colress's madness for knowledge to make Pokemon stronger and Kyurem's emptiness waiting to be filled with truth or ideals have a lot in common, that both Colress and Kyurem has this kind of "void" that desires to be full of knowledge, be it to make Pokemon stronger or Truth and Ideals. 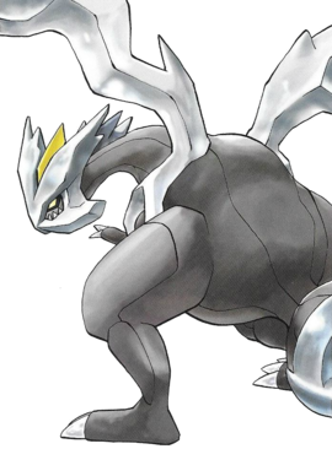 I suppose if you think about it, they both represent an endless void that cannot be filled, literally for Kyurem since he only has access to Black and White Kyurem forms which are like 50% of his original form. My favorite trainers who own a legendary Pokemon would have to be Hilbert/Hilda and N from BW. Aswell as they're portrayel in Pokemon Generations Episode 15 "The King Returns" because it shows the bonds N and Hilbert have with their respective legendary. Tobias from the anime,.... he was boss with his Darkrai and Latios,.. who knows what else he had in his team. My favorite trainers who own a legendary Pokemon would have to be Hilbert/Hilda and N from BW. Aswell as they're portrayelall in Pokemon Generations Episode 15 "The King Returns" because it shows the bonds N and Hilbert have with their respective legendary. Oh man! I know what you mean! 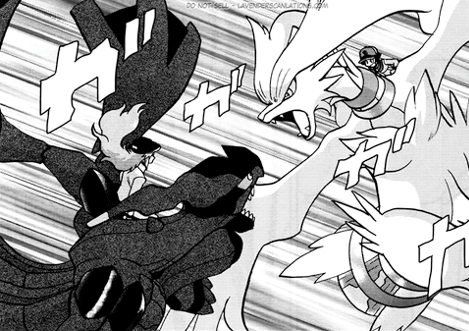 Personally I think the best version is undoubtedly the Pokemon Adventures take because of how much trouble and effort Black does to win Reshiram's trust. It takes Black's anger, determination and winning the hearts of all his Pokemon to fully awaken Reshiram and the battle between Reshiram and Zekrom, Truth and Ideals is so amazing! It's a battle of the skies to be specific.